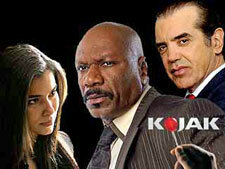 Kojak (2005): Mystery and Suspense on Television. USA Network brought Kojak back to network television in the spring of 2005. Ving Rhames starred as Theo Kojak, a detective dedicated to solving solme of New York City's most heinous crimes. Using years of experience and tough interrogration tactics, Kojak gets to the heart of every crime he investigates -- even if that means pushing the boundaries of the law.Kojak (2005) ran for just 8 episodes. See also the original Kojak starring Telly Savalas.